Spiromesifen works by disrupting lipid biosynthesis in treated insects. Because lipid molecules help regulate water content in insects, Forbid prevents proper water balance, which results in desiccation. The treated mite or whitefly dries up and dies within two to three days of treatment. Forbid has excellent translaminar activity, quickly penetrating the treated upper leaf surface and moving through the leaf to the untreated side to control mites feeding anywhere on the leaf. Forbid also moves into the phloem of treated leaves to control whiteflies as they feed. Most acaricides fall into three categories: neurotoxins and respiratory poisons, which are active against adults and mobile immatures; and growth regulators, which are active against eggs and immatures. Forbid extends effective control and offers more flexibility by being highly active against all mobile and immobile stages of mites (e.g., eggs, nymphs, immobile nymphs and adults), and active against all mobile and immobile stages of whiteflies.ich are active against adults and mobile immatures; and growth regulators, which are active against eggs and immatures. 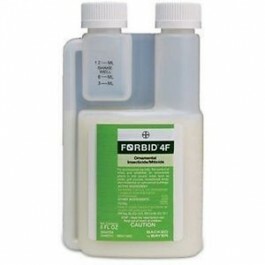 Forbid extends effective control and offers more flexibility by being highly active against all mobile and immobile stages of mites (e.g., eggs, nymphs, immobile nymphs and adults), and active against all mobile and immobile stages of whiteflies. Q: What are the advantages of using a product that controls mites and whiteflies throughout their life cycles? A: By offering control throughout all mobile and immobile stages, Forbid provides an extended window of application. Since most miticides only target one or two life stages, application must be timed precisely in order to achieve maximum protection. Forbid offers considerably more flexibility by working within your schedule. Q: Should I be concerned about resistance management issues when using Forbid? A: Studies have shown no resistance problems with Forbid. Limit Forbid use to three times per season and rotate with other treatments that have different modes of action as part of a sound resistance management program. This item is re-packaged and labeled in a smaller bottle for customer convenience.